Why is it that Jews are so involved in causes dedicated to justice, equality, human rights and peace? Are these trends influenced by religion, history, sociology or something else? Judaism and Justice explores the relationship between Judaism, social justice and the Jewish identity of American Jews. The book traces how the idea of “justice”, as developed in the sacred texts of Judaism, conditions Jewish attitudes and behavior. In a fascinating portrayal of some of the major issues facing the Jewish community in the last 50 years, Schwarz explores a community torn between its instincts for self-preservation and its desire to serve as an ethical “light to the nations”. The book’s overview of new and emerging Jewish social justice organizations yields a bold thesis that helps to explain much of the contemporary Jewish condition. Rabbi Schwarz’s first book, Finding a Spiritual Home, was not only widely read and quoted, but has been used by hundreds of synagogues and rabbis across the country. In it, he offered a new paradigm to help reclaim the American synagogue for a younger generation of American Jews. Judaism and Justice uses a similar blend of history and sociology to offer a new vision for a Jewish community built around a commitment to social justice. The book will speak to the tens of thousands of Jews with deep commitments to justice, peace and equality, connecting that behavior and consciousness to the history, values and wisdom of the Jewish heritage. A directory of Jewish social justice and community service organizations will provide readers with a starting point for meaningful engagement. Judaism and Justice provides a new way to understand Jewish identity. Purchase Judaism and Justice. 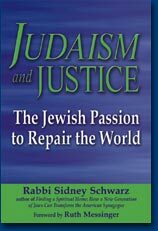 Rabbi Schwarz affirms in his introduction that his book explores the relationship between Judaism, social justice, and the identity of American Jews. He chronicles the organized Jewish community and its public-affairs agenda from the end of World War II in 1945 through the early years of the twenty-first century. The term “organized Jewish community,” he explains, refers to the institutions under the umbrella of the national Jewish federation system that engage in fundraising from the community and allocate money to support local and overseas Jewish needs, as well as projects in Israel. Schwarz divides the book into four parts. Part 1 probes the question, what is the purpose of Judaism? Part 2 offers an interpretation of the five books of Moses and seven rabbinic principles. Part 3 looks at how the Jewish community places itself in the American public arena, and part 4 chronicles new developments in the American Jewish community “that point in the direction of a Jewish renaissance.” An engrossing commentary deserving to be read. Professor, New York University; author, A Sacred Journey: The Jewish Quest for a Perfect World. -Rabbi Elliot N. Dorff, Ph.D. Professor of Philosophy, University of Judaism; author, To Do the Right and the Good and The Way Into Tikkun Olam (Fixing the World). -Rabbi Joseph Telushkin, author of A Code of Jewish Ethics, and Jewish Literacy. Click here to buy the book from Jewish Lights.